High school track and field has always served as a platform for young runners hoping to one day reach elite levels in running, jumping and throwing. But now high school athletes are running times so fast that they could place in college conference meets across the country. Over the years, track and field has become a year round discipline, like many other sports, and it has allowed athletes to be competitive sooner. And each year, younger and younger athletes are leading the nation in various events. Last indoor season, underclassmen led the nation in seven of 17 running events. This year, underclassmen led the country in four of the six sprinting events. As underclassmen in 2018, Tamari Davis showed her dominance over the short sprints, while Athing Mu took over mid distance, and Katelyn Tuohy began her reign in the 1500m, 1-Mile, 3000m, 3200m, 2-Mile and 5K. This year, the bar was set even higher, and by even younger athletes. 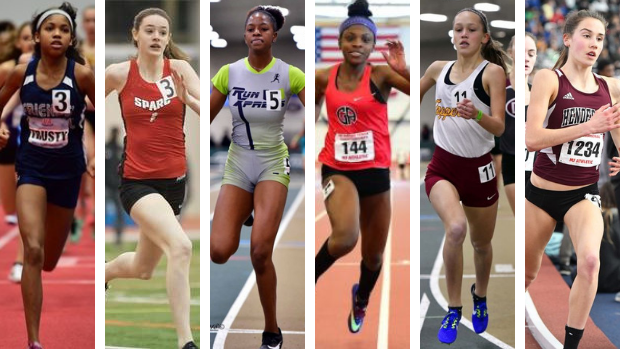 The class of 2022 includes a group of girls that are running times that college athletes have a hard time reaching in their own careers. Each of these ladies were standouts in middle school and summer track competition, but their improvement since that time has set them apart from the rest. And so as the indoor season ends and the outdoor season emerges, it's only fair to recognize this season's best freshman standouts. The girls of 2022 had an indoor season for the record books. As a collective, they outrun freshmen classes dating back to 2000, which featured standouts like, Olivia Baker, Mary Cain, Devon Williams and Cory McGee.